Be the first to share your favorite memory, photo or story of Guilford. This memorial page is dedicated for family, friends and future generations to celebrate the life of their loved one. Guilford L. Moore, age 105 of Grinnell, died on Saturday, August 4, 2018 at St. Francis Manor in Grinnell. A Gathering of Family and Friends will be held on Thursday, August 16th at Smith Funeral Home in Grinnell beginning at 10:00 a.m. His “Celebration of Life” with Sharing of Memories will follow at 11:00. The Celebration will conclude with a “Reunion of Hearts” at the Hazelwood Cemetery in Grinnell. A luncheon will follow in the Social Center at St. Francis Manor in Grinnell. In lieu of flowers, memorials may be designated to the St. Francis Manor Foundation or to Grinnell Regional Hospice, mailed in care of the Smith Funeral Home, PO Box 368, Grinnell, Iowa 50112. Memories and condolences may be shared with the family online at www.smithfh.com. 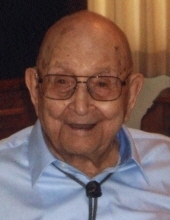 Guilford Lee Moore was born on June 30, 1913 in Wellman, Iowa to Thomas John Moore and Erna Bell (Messenger) Moore. He graduated from Grinnell High School in 1931 and studied Agriculture at Iowa State University in Ames, Iowa. Guilford was united in marriage to Evelyn Serene Lang on September 9, 1935. They were blessed with five children: Joan, Barbara, Fred, Bill and Wanda. Guilford worked at Thompson Grocery and Lang Dairy before farming in the Sheridan, Malcom and Grinnell areas for many years. He and Evelyn retired from farming and moved into their home on 13th Avenue and in 2000 moved to Seeland Park. He was a member of the Grinnell United Methodist Church, director of a country school in the Sheridan area, and a member of the Community Club. Guilford was a family man and an outdoorsman, who enjoyed fishing with family, farming and raising purebred Duroc hogs. His other enjoyments included coin collecting, bird watching, being with friends, and participating in community activities. Guilford had a love for dark chocolate, homemade fudge, jelly beans and singing at family get togethers. Guilford is survived by five children, Joan Stanley of Truro, Iowa, Barbara Fritz of San Antonio, TX, Fred (Patty) Moore of Broomfield, CO, Bill (Sue) Moore of Las Cruces, New Mexico, and Wanda (Tim) Armstrong of Grinnell, Iowa; 12 grandchildren; 28 great grandchildren; 19 great great grandchildren. Guilford was preceded in death by his parents; his wife, Evelyn; one sister, Hazel Palmer; two brothers, Howard and Thomas Moore; two son-in-laws, Virgil Stanley and Gene Fritz; two grandchildren, Laura and Gregory Fritz; two great grandchildren, Brandon Patterson and Rachel Stanley. To send flowers or a remembrance gift to the family of Guilford L. Moore, please visit our Tribute Store. "Email Address" would like to share the life celebration of Guilford L. Moore. Click on the "link" to go to share a favorite memory or leave a condolence message for the family.